If you follow me on Instagram you probably already saw the picture of this luscious dish. I made these little pizzas for dinner Monday night with all my Farmers Market goodies from Saturday. 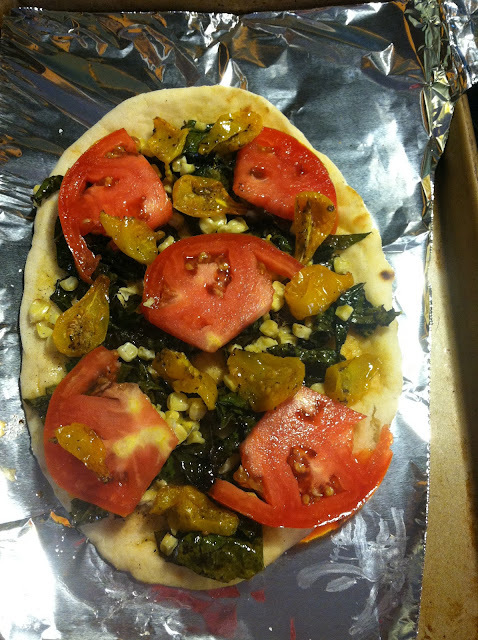 Fresh Kale + Heirloom Tomatoes + Corn is crazy good on pizza. Top with Mozzarella and Goat Cheese and you have a perfect pizza. I am lazy and never make my own pizza dough, I use Naan Bread and just make Matt and I individual pizzas (of course he refused the greens on his pizza). You could use any veggies you have but this combo is delish, trust me. Pizza Pre Cheese Loaded with Veggies. Sautee the Kale in Olive oil until slightly wilted about 5 minutes. Roast the Cherry Tomatoes and Corn (leave on the cob while roasting) in olive oil with salt and pepper on 400 degrees about 20 minutes. Thinly slice the whole tomato. Spread Naan with Olive Oil (I use Harissa infused oil to give it extra spicy flavor) and sprinkle with salt and pepper. Layer with Kale, Corn and both tomatoes. Cover with Mozzarella and Goat Cheese. Bake at 350 degrees about 10-15mins until cheese melts and is bubbly! so yummy. I've been making home made pizza at least once a week lately! So yum! yum!! It's time you put out a cook book!! looks so good - homemade pizza is definitely one of our favorite easy meals! That looks amazing. So yum! YUM! Nothing a good homemade pizza! love all the fresh veggies right now. Yum! Yum!! 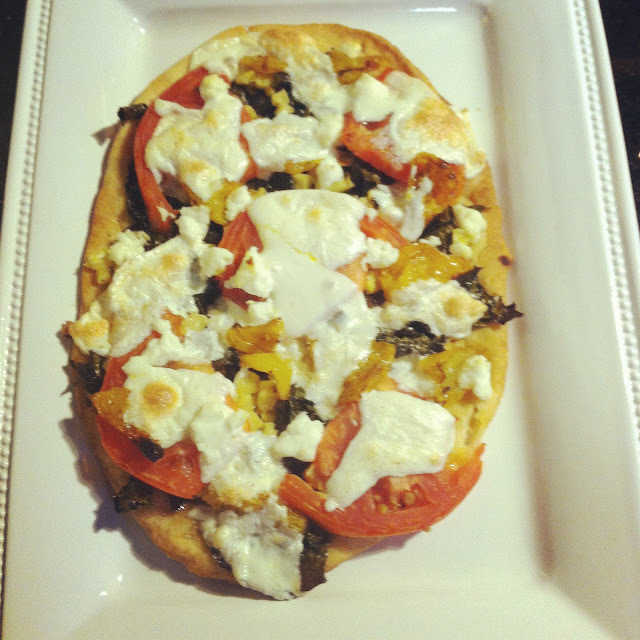 Want to make this tonight..it's been way too long since I have made my Naan bread pizzas!! Oh wow, that looks amazing, and my stomach is growling just thinking about it! This looks divine!! I ordered a may book yesterday!! Thanks for cluing me in! Oooh yum! I am definitely bookmarking this. What a delicious recipe! This sounds so fresh and delicious -- you really do need to come out with a cookbook. Every recipe I've tried from your blog is insane!